Columbia TriStar, widescreen 1.85:1, 16x9 enhanced, pan&scan, languages: English (DD 5.1 & 2.0), French (2.0), subtitles: English, French, Spanish, double side-single layer, scene selections-28 chapters, rated PG-13, 139 min., street date 5/19/98. Supplement: Audio commentary by director James L. Brooks, Jack Nicholson, Helen Hunt, Greg Kinnear, and Hans Zimmer. Academy Awards: Won for Best Actor (Jack Nicholson); Best Actress (Helen Hunt). Nominated for Best Picture; Best Supporting Actor (Greg Kinnear); Best Music; Best Screenplay Written Directly for the Screen; Best Film Editing, 1997. Directed by James L. Brooks. Starring Jack Nicholson, Helen Hunt, Greg Kinnear, Cuba Gooding Jr., Shirley Knight, Yeardley Smith. As part of Melvin's unwavering daily schedule, he consumes an artery-hardening breakfast of bacon, sausages and eggs at a local cafe. The only waitress willing to stand up to his sarcastic tirades is Carol Connelly (Helen Hunt), a single mother struggling to raise her chronically asthmatic son. Simon Nye (Greg Kinnear) has the distinct misfortune of living across the hall from Melvin in their West Village apartment building in downtown Manhattan. A talented contemporary artist, Simon is a current darling of the New York art world, reason enough to draw Melvin's verbal fire. His gay lifestyle is thus only further grist for the novelist's malicious mill. These three New Yorkers - none of whom appears to have a chance in hell at finding real happiness - discover their fates intertwined because of the fourth complicated character in the piece, an ugly, tiny dog named Verdell (played by a newcomer, Jill). The picture is perfectly framed at the approximate ratio of 1.85:1 and exhibits no digital artifact or dirt. The spherical lenses allow sharp focuses across the visual field. The set design consists of bright complementary colors and bathes in warm and natural light which give the picture a very pleasing quality. Nicholson's apartment is more monochromatic and has a quirky display of art deco style furniture and paintings. The inviting atmosphere of the N.Y. café is my favorite setting accompanied by rich and warm colors. Blacks are deep with well defined shadow details. Fleshtones are natural and detailed. The highlight of the soundtrack is the score composed by Hans Zimmer. The score sets the tone for the film early in the picture. The theme is whimsical, heartfelt, charming, and utterly romantic. A sharp contrast to the despicable on-screen persona of Nicholson's character. Despite the idiosyncrastic persona, the score provides hints to the tenderness of the character as later revealed in the film. The score is well recorded and presented with rich clarity. The encoded soundtrack has a warm and subtle ambience for the surround. The restuarants and city sidewalks provide for the most surround activites. Dialogue sounds a bit too up front and noticeably ADR-produced at times. The DVD contains an audio commentary track provided by director Brooks, the main cast, and Zimmer. The commentary can be best described by Brooks as "informal" and I find it to be highly enjoyable. It is a rare treat to have Nicholson in the commentary and even then managed to upstage everyone. I often find myself laughing along with their remarks and anecdotes. Despite the informality, they managed to cover all the topics and even have the composer talks about his experience. It is not too often that a composer is invited to provide insight. The recording was done in separate sessions with different cast but with Brooks as the main commentator. The recording is very well done and provides a seamless integration for each member. 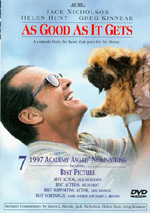 As Good As It Gets is a wonderful romantic comedy as evidenced by the seven Oscar nominations. The script, acting, and dialogue are all superb. The film on DVD is not to be missed!